Do you feel blocked from achieving your goals? Lacking the motivation you desire for life? Life doesn't feel complete and satisfying? These are signs that there is conflict from within ourselves. We often think that the brain in our skull controls all of our thoughts and behaviour, but science has shown that we are also highly influenced by brains in our heart and gut. The heart brain deals with emotions, values and how we relate to others; the gut brain handles action, self-preservation and our core identity; the head brain thinks, and makes meaning and deals with cognitive perception. Multiple Brain Integration Techniques (mBIT) harness and align the intelligence of all of our brains to help achieve happiness and success. 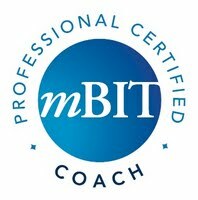 As one of the first to be fully certified as an mBIT Coach in New Zealand, I can help you connect with the deeper part of yourself to get more out of life. Find out more about mBraining. The starting point for all mBrain coaching is balanced breathing. This is a simple process of slowing down breathing to approximately six seconds of inhalation and six seconds of exhalation. Practise for just a few minutes and you should notice a profound effect on the state of coherence of your heart, which affects your body and mind, as a whole. Download a helpful breathing pacer MP3 and get breathing!